The Cat Café are delighted to welcome the legendary Richard Kennedy on Friday 19th October, from 8.00pm. Join Elaine and Bruno for great food, wine, beer and cider. More great live music at The Cat Café, Wincanton on Friday 21st September at 8.00pm. The Cat Café is delighted to welcome the return of Nobody's Business - a Roots Blues Guitar and Harmonica duo. The Cat Café are delighted to welcome the return of Kangaroo (half) Moon - next Friday 6th July 2012. Kangaroo Moon performs a creative, 'hoppy' mix of slightly psychedelic folksy roots and diddly dee - you really have to see it! 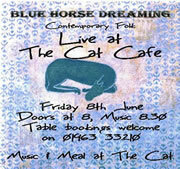 The Cat Café are very happy to host another evening of quality Music and Munch on Friday 8th June, with "Blue Horse Dreaming", an accomplished, locally based contemporary folk trio who will be performing many of their self-penned works. A New Café In Town! Elaine and Bruno welcome you to The Cat Café, Wincanton, the new, relaxing place to eat in the heart of Wincanton. Join us and sample our varied menu, beers and wines.